Online Booking Is now Available. To Book your spot at Edgewater Family Camping Resort This Summer Please Reserve Online. Thank you so much for visiting our web site. We are so excited for what we have created here…. memories…… friends…… summer fun …… special moments spent camping that will last a lifetime in Prince Edward County!! We are a family oriented campground offering the best in camping near Sandbanks Provincial Park, we have 84 sites for seasonal trailers and 40 camping sites for overnight or weekend camping. (see campsite map) There is a great mix of shade trees in our campground as well as some partially sunny sites if that is your preference. 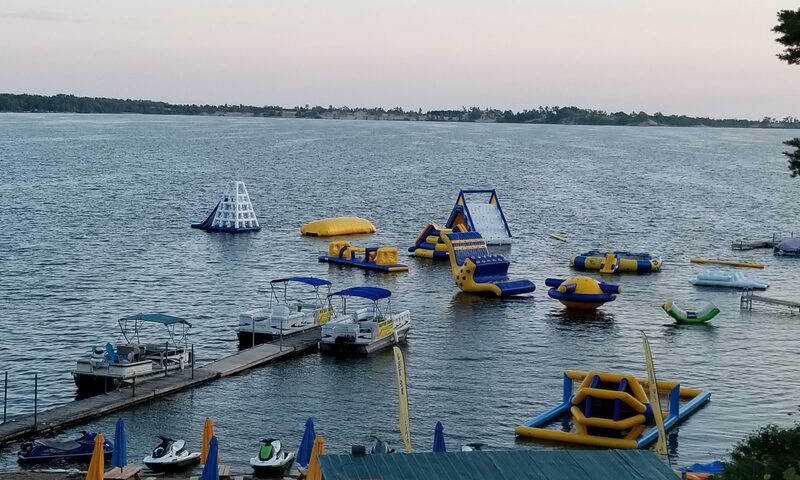 Westlake Willy Water Park is a separate business located at Edgewater Family Camping Resort. You can purchase tickets at a discount when booking online. Edgewater Family Camping Resort offers the ultimate in family fun camping in Prince Edward County and only 5 min from Sandbanks Provincial Park and convientely located right between Toronto and Montreal. Our camping Park is tiered to give each one of our campers a view of the West Lake. Imagine being able to see the ever changing sands of the World Famous Sandbanks Dunes from a lazy chair on your trailer camping site. We have a selection of seasonal sites left with a mix of 15 to 30amp. On any given day you will see children happily fishing, swimming or playing on the beach at Westlake Willy Water Park. Ride the bike trails, walk the island road or soak up the sun. Sandbanks Provincial Park is only 5 minutes away. The horseshoe pits see a lot of use whether for a lazy game or a rousing tournament on weekends. Our family camping (tenting) area is dotted with mature trees for shade and some sun. They are no-service sites with a central water tap. Dad/Mom & their small children can fit nicely on the site. Our seasonal camping trailer sites are tiered for the best possible view of the world famous Sandbanks Dunes from each lot. Our Camp Park offers a good mix of treed lots as well as some that take advantage of the sun if you so desire. Many of our seasonal tenants are retirees and families. We have a good selection of seasonal camping sites available. There is a mix of 15, 20 & 30 amp hydro available. Don’t forget to bring your bicycle to tour around the many mapped areas in Prince Edward County, or you can rent one in nearby Bloomfield. We are proud of our Lodge which is made of logs from good Prince Edward County trees from Shebas Island and was constructed some 80 years ago. It is our gathering place for activities or for just sitting in front of the floor to ceiling fireplace. You can watch satellite T.V. on a 12 foot screen, shoot a game of pool, or play a great game of darts. We must not forget the hand scooped ice cream and candy store in the Lodge for the sweet tooth’s of the Camp Park. Our seasonal campers also have an active social committee. They are always planning activities for our seasonal campers to enjoy. Thank you so much for visiting our web site. We are so excited for what we have created here…. memories…… friends…… summer fun …… special moments that will last a life time in Prince Edward County!! Please bring your own linens, towels, pillows -Maximum of 4 (2 adults and 2 children) -queen bed sleeps two (2) -futon/couch sleeps two(2) Saturday to Saturday weekly rental or 3 night minimum rental if available. **FAMILIES ONLY PLEASE** **NO PETS** **NO SMOKING OF ANY KIND** 50% DEPOSIT REQUIRED…SORRY, DEPOSIT & BALANCE IS NON-REFUNDABLE BALANCE IS DUE 3 WEEKS BEFORE ARRIVAL 13% HST to be added (Money order, Certified cheque, eTransfer) Renters of this trailer receive **4 FREE PASSES** to West Lake Willy Water Park for the entire week, compliments of the Waterpark also a free parking pass to Sandbanks Prov Park (if available) to use during the duration of your stay. Free use of the kayaks & paddle boards and paddle boat (if available).